We are over the moon about celebrating our 20th Anniversary this season. It is impressive that a little volunteer, community based, art studio tour would not just survive 20 years but thrive! Since we are very much a community centred organization we have created ways for you to help us celebrate. We hope you can come out and join us at some of them as well as on Mothers Day Weekend! The one we are really excited about is our Faces Over Fences: Discover the Artists in Your Neighbourhood” project. 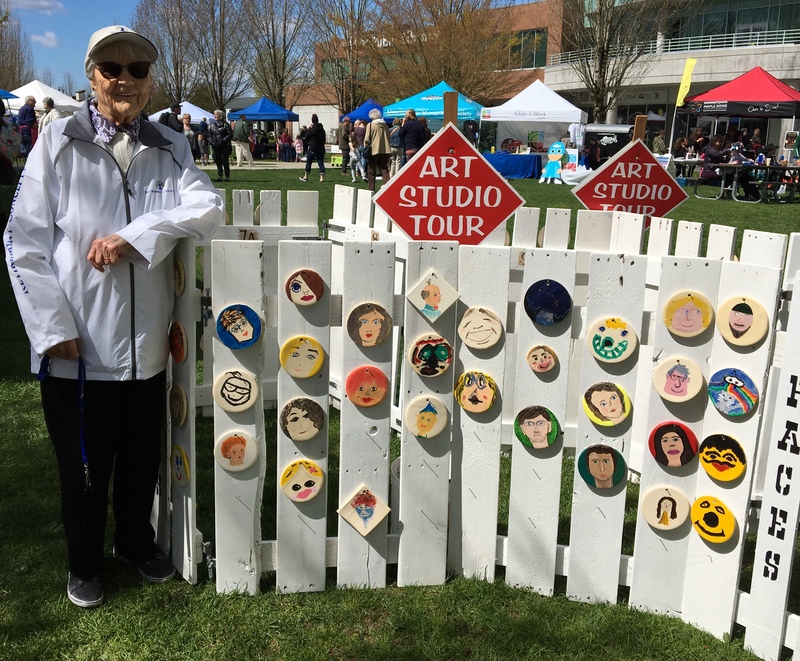 It is a collaborative, community-based art project and temporary art installation led by artists from the Maple Ridge Pitt Meadows Art Studio Tour and comprises an expanding white picket fence, symbolizing the dividers and connectors between neighbours in our community. It will be decorated with self-portraits made by community members of all ages. The self-portraits are painted in acrylic or glaze on clay tiles that have either been bisque fired or fully glazed and fired. The portraits reflect our belief that everyone can be an artist and that community is an active engagement created when people meet and get to know each other, such as when neighbours chat to each other over the fence or create art together. This collaborative, community-engaged project will engage residents of Maple Ridge of all ages and walks of life. The project kicked off at Kanaka Creek Elementary School, where Art Studio Tour artists Kerry McLaren, Val Wheater and Brigitta Schneiter worked with teachers and students to create the initial set of “faces” for the fences. Lynda Sangster, Cindy Johnston, Connie-Jean Moore, Sole Avaria, Val Wheater were our painters, and Soren Isbrand, Brigitta Schneiter and Kerry McLaren were busy rolling out the clay! 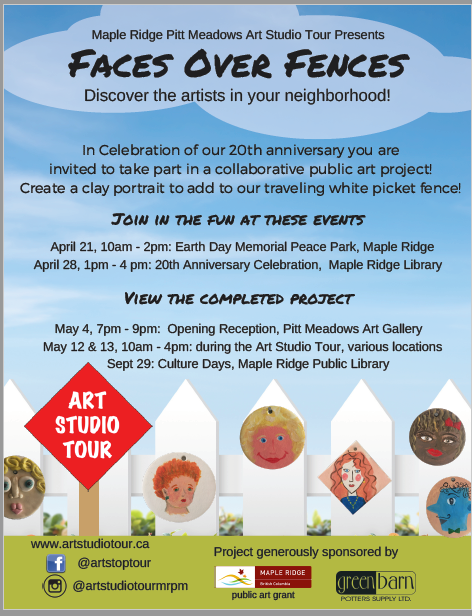 The Maple Ridge Pitt Meadows Art Studio Tour gratefully acknowledges the support of the City of Maple Ridge Public Art program, and to Green Barn for generously donating the clay for our project! Join us in creating our public art project ‘Faces over Fences: Discover the Artists in Your Neighbourhood.’ Paint a small self-portrait on clay to add to our picket fence showing the diverse faces of artists in our community. Various artists from the Art Studio Tour will be on hand to talk to the public and there will be demonstrations. 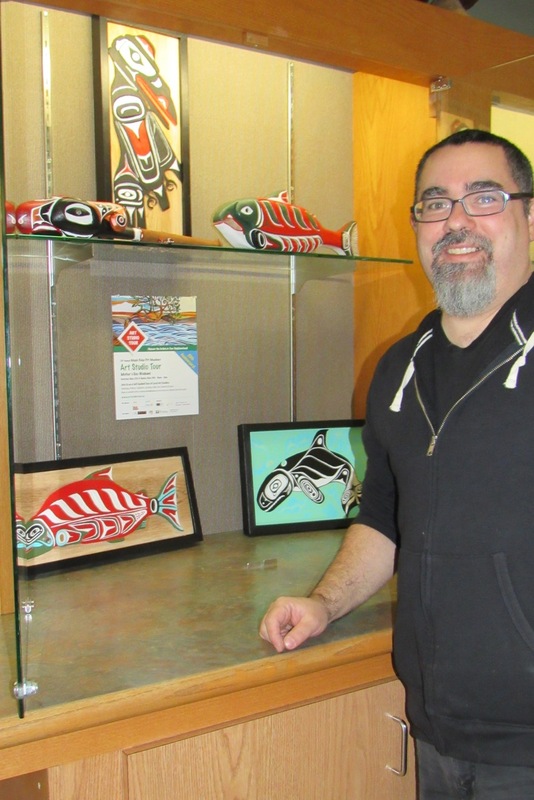 Join us for our 20th Anniversary Celebration at the Maple Ridge Public Library, featuring our ‘Faces over Fences’ installation, artist demonstrations, cake and refreshments! This lively event will include hands-on demonstrations and workshops throughout the library with Studio Tour artists. The “Faces over the Fence” project will be hosted in the main lobby where library patrons will be invited by Tour Artists to paint their own portraits on bisque-fired pottery and hang them on our picket fences. Join us at the opening reception for the month-long exhibit of the Tour Artists’ work. The “Faces Over Fences” project will be at the reception. The public will be invited to see all the faces of artists in our community, young and old, amateur and professional, peeking over the fences and saying hello. We will also again have materials on hand for people to make their own portraits to add to the installation. Hope to you all soon over the fences!